It's time for pumpkins, scarecrows, and everything FALL as we begin the harvest celebration! Enjoy some fun fall activities designed for your child's current development and beyond. Take a hay ride as a family, carve a family of pumpkins with toothy grins and enjoy everything that this season has to offer." Are you in a baking mood? If you are making fall-scented treats such as apple pie and pumpkin bread, bring it to your baby to smell after it has had time to cool. See if he or she has a change in expression. Help your child learn cause and effect with a ribbon ring. Tie multiple ribbons in different textures and colors to a smooth wooden or plastic ring and allow your baby to shake and move it. For a fall twist, look for a way to securely attach (such as sewing) fall colored leaves to some ribbons. Parent Note: Be sure to supervise this activity and remove the ribbon ring as soon as your child is done exploring it or if any ribbons or items attached to it separate. Sing a fall-themed fingerplay to your baby, counting his or her fingers or toes as you sing. Ten little pumpkins on a vine." Are you crafty or do you have a friend or family member that is? Consider making a fall fabric book. Sew fall cutouts such as pumpkins, apples, and leafs in different colors on different texture fabrics (corduroy, cotton, flannel) and secure the pages together into a book. Enjoy lazy rainy days inside cuddled with a new book. Find a comfortable spot where you can sit quietly and watch the rain while enjoying books wrapped together in a fluffy, warm blanket. Have your toddler help you make a special placemat for every member of the family to make a regular school week dinner into something special. Tape several fall leaves to the table, cover the leaves with paper, and rub them with the side of a crayon to make imprints. Optionally get the placemats laminated to last beyond spills and messes. Take a nature walk as a family. Be sure to give everyone a small brown paper lunch bag so that they can collect items along the walk. When you return home, have everyone share what items they placed in their bags and why they selected those items. Optionally place your items in a bowl or basket somewhere as a nice fall centerpiece. Cut apples and place five or six slices into a strong resealable bag - one for each family member. Then, have everyone make their own applesauce by mashing apples with a wooden block or wooden meat tenderizer. If they cannot mash them with the block, the bag can be placed on a cookie sheet on the floor and the child can step on the block to mash. Scoop the applesauce into bowls, add a dash of cinnamon and sugar, give everyone a spoon to mix it together, and enjoy! Parent Note: If you or your child will be using a wooden block or meat tenderizer to mash your bag, be sure to do so gently to avoid applesauce coming out of the bag. Draw a tree or cut a tree out of construction paper and glue it to a piece of paper. Provide your child with 4 colors of paint—yellow, red, brown, and orange and 4 Q-Tips. He or she can place little leaves on the tree or that have fallen or are falling to the ground in their every own fall masterpiece. 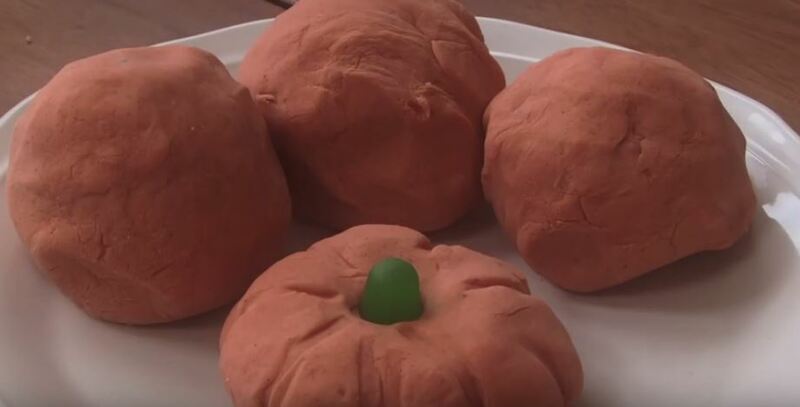 Keep this activity in mind to make jack o’ lantern carving into a math activity. Have your child estimate your pumpkin’s weight and then place it on a scale. Have your child estimate how many seeds are inside their pumpkin and then count them when you empty the gourd. Mix flour, salt, cream of tartar, oil, pumpkin pie spice and pumpkin puree together. Add boiling water (add in batches) and mix with a spoon until everything is combined. After the mixture is cooled, take it out of the bowl and knead it until it is not sticky (adding flour slowly as you go until you achieve this texture).